Ambedkar Periyar Student Circle challenges the ban: 'We do not understand how dissent and criticism of the government’s policy is akin to "spreading hatred"'. A controversy has arisen in IIT-Madras as it has banned Ambedkar Periyar Student Circle, a discussion forum for students to promote the ideology and writings of BR Ambedkar and Periyar EV Ramasamy, after the ministry of human resource development made an inquiry regarding an anonymous complaint it had received on the activities of the Dalit rights group on the IIT campus. 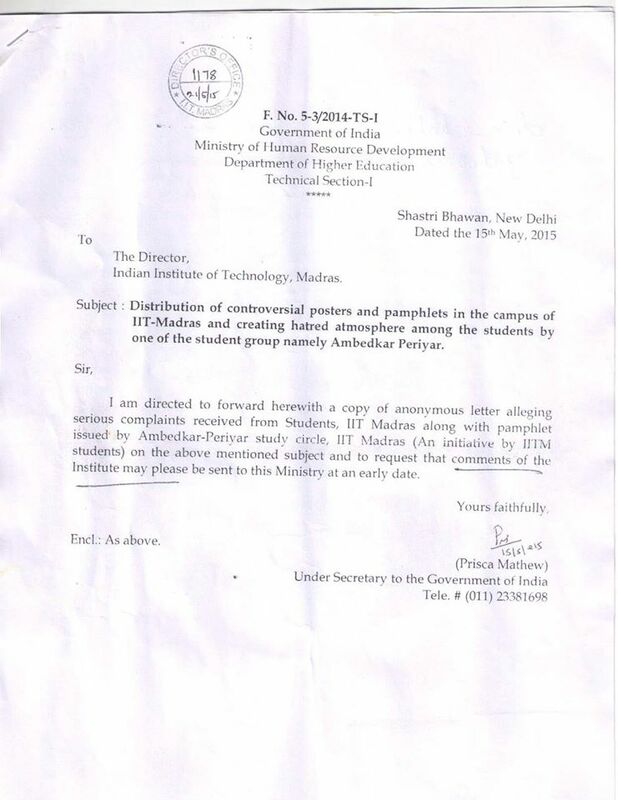 Prisca Mathew, under secretary to the government of India in the MHRD, wrote to the director, IIT Madras on May 15, 2015 on "distribution of controversial posters and pamphlets in the campus of IIT-Madras and creating hatred atmosphere (sic) among the students by one of the student groups namely Ambedkar-Periyar". The pamphlet reproduced excerpts from the speech of R Vivekandanda Gopal, an academic with the Dravidian University, on the "Contemporary relevance of Dr Ambedkar" at an event organised by the APSC on the IIT campus in which he had criticised the Modi regime for "pro-corporate" policies such as the Land Acquisition Bill and insurance and labour reforms. 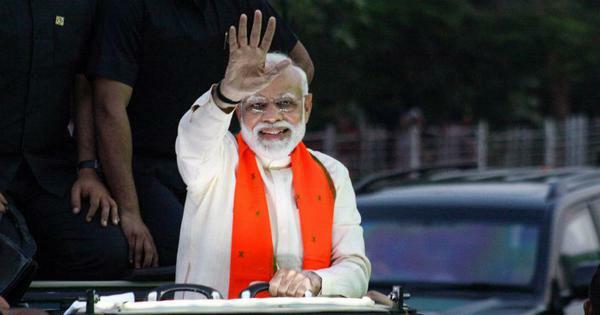 The speech also accused the government of "communally polarising" people by introducing a ban on cow slaughter and through ghar wapsi programs. On May 24, Sivakumar M Srinivasan, the IIT dean for students, wrote to the APSC, informing the group that it had been "derecognised" and will not be allowed to use facilities on the campus including the auditoriums for its functions. The APSC answered the mail in the following mail to explain their stand. We the students of Ambedkar-Periyar Study circle are writing you regarding our stand on the recent email that we received from the Dean of Students, de-recognized our students’ organization. The mail from Dean of Students dated on 22/05/2015 says “because of the misuse of the privileges” given to your study circle (Ambedkar-Periyar study circle) as an independent student body, your student body is de-recognized by the institute. 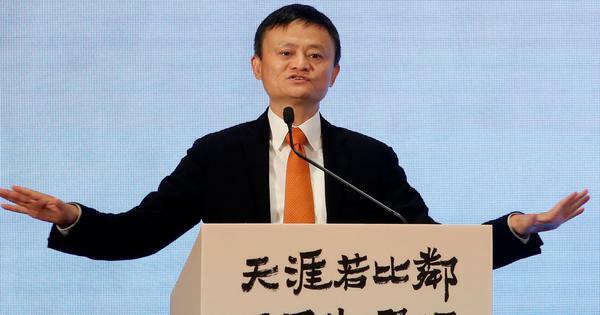 However it does not contain any details regarding the privileges misused by the APSC. The Dean’s office has provided us with a copy of a letter from the MHRD dated 21/05/2015with the ref no. F. No. 5-3/2014-TS-I. The letter stated that the MHRD has received serious complaints regarding the activities of our study circle through anonymous letter. A copy of one such letter was provided. We wish to respond to the allegations in the complainant’s letter. 1. It has been alleged that we have spread hatred against the Modi government and a copy of our pamphlet on the occasion of Ambedkar Jayanti was enclosed. We do not see any merit in such a statement. We stand by our opinions. Yes, we were very critical of the government. However, we do not understand how dissent and criticism of the government’s policy is akin to “spreading hatred”. If any person professing an anti-establishment view is accused of engaging in “controversial” activities and all dissent is stifled, wouldn’t that be a violation of our constitutionally guaranteed rights to freely express ourselves? We feel that a vibrant and proactive civil society is an integral part of a healthy democracy. IITM itself have had many meetings that discussed the policies and legislation’s of the current and previous elected governments. Among them the reservation policy is the one which has not been still implemented in IITM campus. Here we want to raise a rational question on IITM’s stand on the reservation policy which is still an alive Government policy even in Modi Government since Independence. When OBC reservation was announced by then Govt., whether anti-reservation student group of IITM simply sat without commending because that its ‘government’s policy’ or it fought against it on the streets of Chennai with its tooth and nail to stop that move? What was the action taken by IITM towards those who fought on streets against the Govt. Policy on Reservation? Rather, the IITM took part in negotiating a raise of 24% to safeguard the vested interested of those anti-reservation body functioning in IITM? 2. We have been accused of spreading hatred between SC-ST and the Hindus and vitiating the atmosphere of the institute. We are surprised and slightly amused. Are SC, ST not part of the so called ‘Hindus’? How MHRD and IITM is perceiving such a venomous anonymous mail with full of hatred towards the SC, ST and Ambedkar? Are we the one who polarise the students or they are the one who think IITM is their own base to propagate against the interest of SC, ST, OBC who are the majority in our Society? Rather our organization is engaged in propagating Ambedkar and Periyar thoughts, in helping depressed castes and the caste Hindus to realize the evilness of caste based discrimination taking place in modern India and expose the ideology functioning behind such discrimination. When we talk about the hierarchical caste structure existing in Indian Society, inevitably we end up in talking about the present pathetic condition of peasants and labours. There are a number of sociological studies that will bear us out when we say that caste based discrimination is still very strong in our society, that caste based associations can leave some with privileges that add up throughout their lives while those that are excluded face powerful social barriers to their attempts to improve their social and economic status. We have only been discussing these issues with an aim to make a common platform for all students in spite of their caste and creed so as to dismantle the evilness of caste barriers. However, even in 2015, our activities are seen to be too radical by the religious right. If the religious right has the right to be offended, then don’t the oppressed Dalits and Bahujans who still face powerful prejudices have a right to be offended with the state of affairs? Our pamphlets do not have any material that would surprise a sociological or political scientist. Yet, the institute has taken these complaints seriously and has chosen to derecognise our organisation. Any higher education institute should be a platform where critical thinking and dissent ought to be encouraged. Where brave new thoughts are nurtured. However, the “dangerous” ideas that we have been accused of spreading are at least a few decades old, if not a few centuries. 3. The complainant has taken exception to one of our meetings which dealt with an MHRD circular regarding vegetarian and non-vegetarian mess halls. We do not understand how anybody’s sentiments could have been hurt when the entire discussion was about the right of every individual to decide what they can eat. This meeting could be seen as trivial when compared to the meetings on much larger issues. However, the complaint against this meeting indicates how unsparing the dominant establishment has become when it comes to stifling dissent. If such a trivial freedom such as being able to eat meat in the mess halls is seen as dangerous, then the continued existence of our study group becomes all the more important. 4. Another issue that the complainant has taken exception to is a meeting that discussed language politics and the primacy given to Sanskrit and Hindi in the disbursement of central funds. We had a Linguist from HSS, IITM and a linguistic scholar from Pondicherry University who led the discussion. 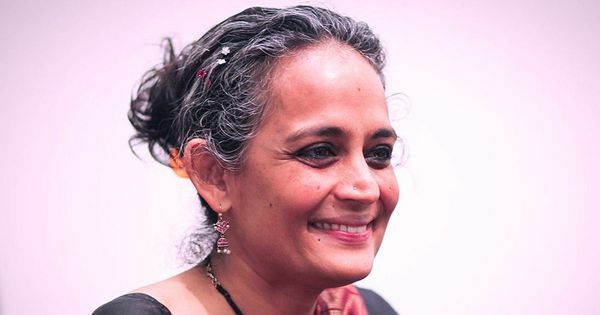 As rationalists, we feel that though Sanskrit has a valued place as part of culture and history of certain sections of our society, it is also an instrument of spreading a Brahminical, dominant narrative. Imposition of Sanskrit in school has less to do with teaching a language and more to do with the ideology behind teaching the language. We stand by our opinions and wish to assert our rights to profess our opinions freely. 5. Finally, we have been accused of getting funds from the outside organization. This allegation is completely baseless and absurd. So far for all the programs the financial support had been taken from the study circle members’ own pockets and collected in paisas from IITM students at their doorsteps which was witnessed even by those who wrote the above said ‘anonymous pettition’. Why we had to collect in paisas from the students to conduct our events through a platform like APSC is because IITM rejected many of our moves to bring personalities like Prof. Chaman Lal through EML. Since its birth, EML is been the monopoly of religious right wing to propagate their metaphysical idealist ideology and is a platform for corporate think tanks in the scientific and academic fraternity. When the taxpayers money is been spend for propogating anti-people, anti-rational agenda, pro –people, rational groups like APSC have to collect money from the students to conduct its events. We are maintaining proper account for all our expenditures. Our discussions, meetings and pamphlets are meant to kick start a discussion within the campus among the academic fraternity. The issues that we discuss are very important and define the way we live our lives. IITM is a public funded higher education institute, whose vision and mission should abide for the upliftment of the common mass, who are the taxpayers. Rather, the move from DoS, IITM says there is no space for such opinions and discussions. We would also like to know what exactly constitutes the “misuse of privileges” and how the specific issues raised in the complainant’s letter could be deemed controversial? The right of function of any independent student body is not the ‘privilege’ given by the authority, rather it’s the democratic right of student themselves. We strongly believe that what we stated in our pamphlets and content of our discussion is correct and as per the Constitution. Therefore, action against the Ambedkar-Periyar Study Circle by the DoS, IITM is undemocratic and unilateral against the interest of common mass for whom the Institute itself is indebted; hence we are not accepting this decision taken by the Institute.